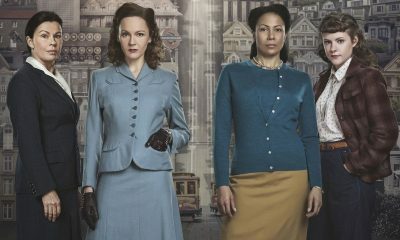 Coming off the successful earlier series THE BLETCHLEY CIRCLE, our heroines Jean (Julie Graham) and Millie (Rachael Stirling) are back for a second series where they get caught up in an investigation into the death of a friend who died 14 years earlier. In the intervening 4 years since the war, both Jean and Millie are feeling a bit unsettled and seek to be able to contribute more with their newfound intelligence and investigative skills. So it is too enticing to ignore when another women’s dead body turns up, albeit in San Francisco, who appears to have died in a similar manner. 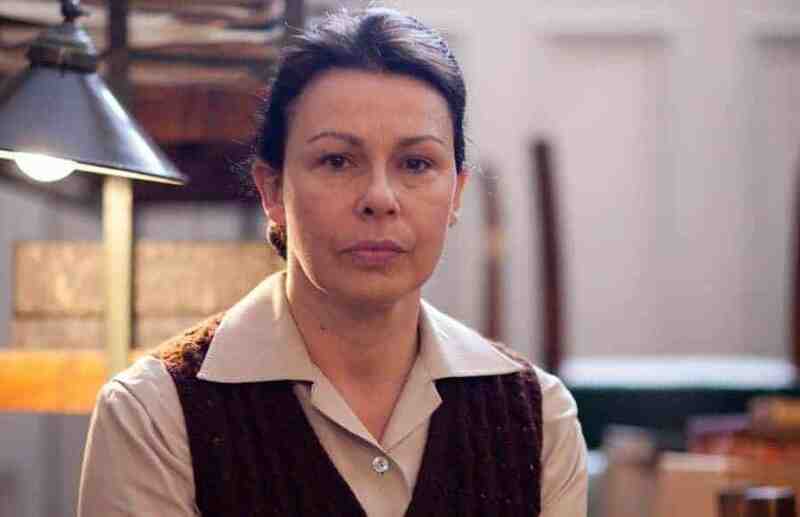 In an exclusive interview, Julie Graham talks about the fun of bringing her character Jean back for another BLETCHLEY CIRCLE mystery and adventure. You’re getting a chance to revisit these characters four years ahead in their timeline. What is it like for them to be coming back out to pursue justice once again? JULIE: I think they’ve gone back to kind of living their mundane lives. I don’t think life’s very exciting for them — well, certainly not for Jean. She’s stuck in a dead-end job and she’s kind of trying to change things by applying for the diplomatic position or foreign service, but she’s rejected and I think that’s the catalyst for her to go and explore the ‘brave new world’ of San Francisco. She seems most tenacious in pursuing a life that she wants and not the life that society seems to want to stick her into. It’s like she’s chafing against those expectations. So it’s good to see her have the determination to pursue something she wants to do. JULIE: Yes, because I think that wasn’t the norm. I think that so many women just accepted their lot, which is fine, but I think there was a terrible kind of ‘brain drain’ when women were thrown back on the ‘scrap heap,’ so to speak. I think it set us back quite a lot for a long time. Because women were so useful during the war, and I think if we just allowed that to carry on, I think we’d be living in a different world today. It’d definitely be a better world. I would appreciate that. JULIE: Yes, exactly. I think it’s slowly changing now, but not quick enough for my liking. That’s why we appreciate these stories. It’s wonderful to see that women contributed to the war effort and were so significant — that they pursued lives that let them express themselves and contribute more fully. It’s nice to see that on screen. JULIE: Definitely. Absolutely. And I think that’s what’s so compelling about this story. You’ve got these great stories and great plots as it’s all kind of sleuthing and code breaking and puzzle solving and all that stuff. We have a great tradition in Britain of who-done-its and detective stories and stuff. But on a more serious note, it is reflecting what happened to these women after the war, and how they were sort of thrown on the ‘scrap heap’ really. On a fun side, you also got to revisit working with your costar Rachael [Stirling]. How was that for you? JULIE: Oh that was fantastic! I mean, Rachael and I are great mates anyway, but we very rarely get a chance to work together. In fact, I think it was the first time we’d worked together for about 15 years when we did BLETCHLEY CIRCLE. We’d worked together before in the theater but not on TV. So to get to work with her again was just a joy because we do have a good time and we have a laugh. So it was wonderful. Did you actually film in San Francisco? JULIE: No, we filmed it in Vancouver or ‘San Fran-couver’ as we called it. I think logistically we couldn’t film in San Francisco. Also because it was a Canadian production company in conjunction with BritBox, I think we had to shoot in Canada. But that was absolutely lovely. I’d never been to Canada before, and I really loved it so. In this sense, you had real-life paralleling some of your characters in that since you were getting to explore a whole new world. JULIE: [Laughs] Yes, that’s absolutely true. We were able to use that. It was great. Again, these stories are fabulous. They’re stories for women about women doing things that were not just simply things that were dreamed up. They actually did these things in real life. It’s really remarkable that we’re finally learning about their stories. JULIE: I just think that’s one of kind of the great hooks about the series is that there’s not really a lot known about these women. Their stories were never really documented in the way that other stories were in terms of the war and what the war effort was. History is written by mostly men, and these women were almost kind of edited out of history. So it’s very difficult to do research because there’s not a lot of documented evidence. Even when these women were interviewed, there was nothing showy about them. They just kind of told it as it is. They’re not kind of self-serving in any way. That’s what’s one of the fun about our show — discovering and unearthing these stories about these women. I think that’s why people love the show so much. After working on these two projects, the original series and this one, has it left an impression on you? Has it inspire you to pursue more projects revealing the part these women played in history? JULIE: Well, I do think that’s important. I don’t want to be the kind of flag bearer. But ,as far as I’m concerned, I want parts written for women just because they’re people, rather than women. Because women are very underrepresented. I mean, especially women of a certain age in television. I think it’s definitely changing, getting better. But these stories do have a parallel. I just couldn’t turn it down: (a) I wanted to revisit this character, and (b) I couldn’t turn down a great part for women because there’s not a lot of them around. And I really loved working in a female-led show because again. You don’t get the opportunity to do that very often. I love Lexi [Alexandra La Roche]! I just love her so much, she was brilliant. I love working with female directors in general, and I don’t get to work with them enough. But, I absolutely love — we all loved working with Lexi — she’s fantastic.